They're here! The intuitions Bracelets have arrived. Available in standard cuff or adjustable friendship style, each bracelet is accented with a genuine diamond. 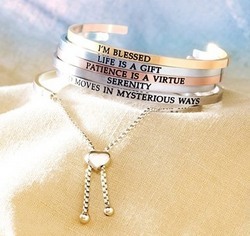 Each Intutitions bracelet comes with it, a special personal mantra of spirituality, inspiration, or just a sweet reminder. Wear one by itself, or stack several together for a chic, modern look, Intuitions are a wonderful gift for oneself, or a loving gift to friend, or family member. Connect yourself together with a great, personal message of hope, love, creativity, and encouragement. These cuffs fit nearly any wrist. Intuitions motivates you in style. These wonderful bracelets are available at Diana Jewelers of Liverpool, and come in three different colors: gold, silver, pink. Pick your favorite quote, choosing among more than 200 options.